This model Triton Red-Dot Sight features a 5 MOA Dot Red/Green/Blue reticle. For unmatched versatility, this reticle can be illuminated in green, red or blue at various brightness settings. The 11-position rheostat controls the brightness to perfectly match any lighting condition. Lightweight and easy to mount, the Triton Red-Dot Sight features an unlimited eye relief, a wide field of vision and multi-coated lenses that produce 95% light transmittance. A special anti-reflective interior eliminates stray light from appearing inside the sight. 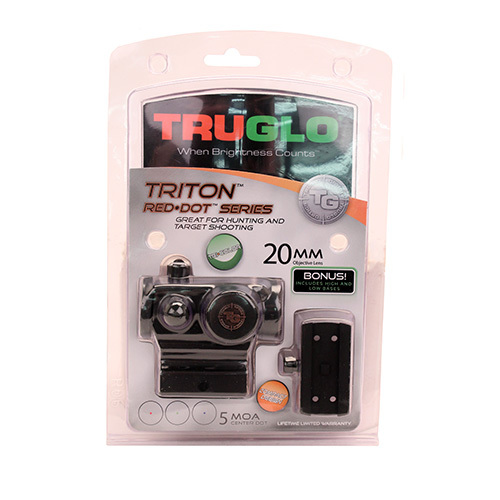 The TruGlo Triton 20mm Red-Dot Sight is waterproof and fog-proof. It is great in most any environment and performs well even in inclement weather. The Triton 1x20 Red-Dot Sight includes low mounting base and runs on a 3V-CR2032 battery (included).